From Amazon: Clay Jensen returns home from school one day to find a mysterious box, with his name on it, lying on the porch. Inside he discovers 13 cassette tapes recorded by Hannah Baker - his classmate - who committed suicide two weeks earlier. On tape, Hannah explains that there are thirteen reasons why she did what she did - and Clay is one of them. If he listens, he'll find out how he made the list - and it'll change Clay's life forever. I have found this difficult to review and have spent ages staring at my computer trying to find the right words to describe how I feel about this book. I had wanted to read it for ages, having read amazing reviews for the US edition and was super excited to get my hands on a copy when it was finally available here in the UK. However I found myself disappointed in it. 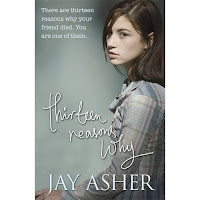 That’s not to say I don’t think it was well written because I do: Jay Asher did an amazing job creating the characters and fitting Hannah’s story into Clay’s narrative. The problem I had was I hated the story. Or rather I hated Hannah’s actions and not just her decision to end her life but also with the whole concept of the tapes. I understand why some people were on her list of recipients but there were others where I felt their inclusion was cruel. I thought the whole point of the novel was to convey the message that we should take note on how we treat others because it does have consequences yet I felt Hannah’s actions both with her death and with the tapes went against that. Instead of feeling sympathy towards her I just felt angry. I know I may have forgotten what it was like to be a teenager but none of what she described felt, to me at least, as something you couldn’t get back from. As you can see I spent a lot of time thinking about this novel and although I may not have liked it I’m starting to think that might not have been its intention. If the author’s aim was to make me think he succeeded. And will I think about how I treat others after reading it – definitely. Interesting review - I think it's good to get different opinions on books. Did Hannah annoy you becaus she let everything get to her so much? Thanks for the comment. I think it was more that everything was about how it affected her. That she wanted other people to consider her feelings but wasn't thinking about how her actions affected others. Does that make sense? Yep that makes sense! I know exactly what you mean.